All 2012 Sugar Bowl coverage can be found on the Bowl Game page. I went into this game with the expectation that it would be a good barometer for how the Hokie linebackers handle the option. Of course, that ended up being an ill-conceived goal as the Georgia Tech flexbone attack is like nothing Michigan runs and the linebackers played as such. The one thing I could glean from the defensive front of Virginia Tech in this game is that they have trouble defending the pitch option on the outside. For most of the game, the linebackers were caught in no-man's land and would bite on a fake pitch. That's not much, though. Of course Wilson can pick up yardage here. Wilson will run to his left here where he has four blockers against four box defenders. Virginia Tech will pull a weakside lineman as well. This is just poor alignment by Georgia Tech that was brought on by pre-snap motion. If Michigan's defense can align properly before the snap, I don't expect Wilson to be able to do much. The other notable aspect of Wilson's game: he has stone hands. Given the amount of checkdown passes Virginia Tech used against Miami, the few drops that I saw from Wilson I brushed off as a bad game (you can't gameplan for that many checkdowns if your running back can't catch). But he showed the same brick hands against Georgia Tech. You can't really blame him for some of his poor rushing performances, though, because the interior of the Virginia Tech offensive line is terrible. Headlined by sophomore center Andrew Miller, the interior of the Hokie offensive line gets put on skates on most plays. Any iso play up the gut is shut down in the backfield. The lack of production from the center probably also hurts the performance of the guards, but Mike Martin will be salivating to go against this interior line. Expect at least a few sacks from Michigan's tackles in this game. That weak interior line also means that Virginia Tech rolls the pocket on almost all third-and-long situations. It's clear that the offense has no faith in their offensive line and tries to get Logan Thomas on the edge to make throws in obvious passing down situations. Thomas is a really good QB, though. He's got a rocket for an arm and with a clean pocket can make all of the throws. His receivers can come down with some miraculous catches, but Thomas throws with power and precision. The other thing he does is QB sneaks. 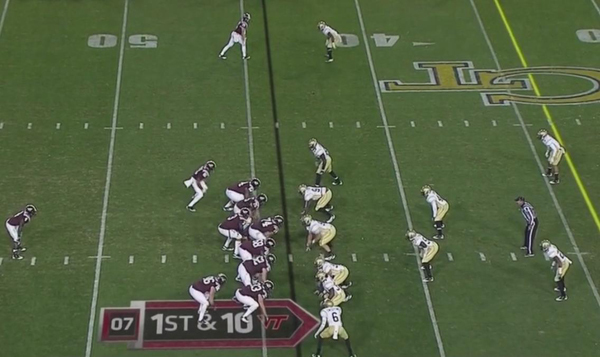 Basically any time the Hokies need one yard, they sneak Thomas up the middle. They did this against Miami and Georgia Tech. It makes sense when you have a 6'6" semi-mobile QB. There really wasn't much else from this game. The offense showed a triple option which I'll break down tomorrow, but otherwise, there wasn't much. A few great catches by VT receivers and some long runs by Wilson created off of poor defensive alignment, and that was about it.